During my yardword this summer, I turned a lot of rocks out of the ground. 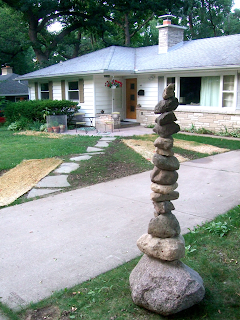 There were also some rocks harvested from little piles around the property. I gathered them all together and built this cairn. It was balanced precariously, and I knew it wouldn't last long. I was surprised when it lasted over the first night, but I wasn't surprised when it didn't last until the next night. The largest stone, on the bottom, was truly difficult to move.